At the HelloFresh Farm, we like to pack as much flavour as possible into our dishes, in as short a time scale as we can. Our trick in achieving this is to use sausage meat already packed with delicious ingredients. 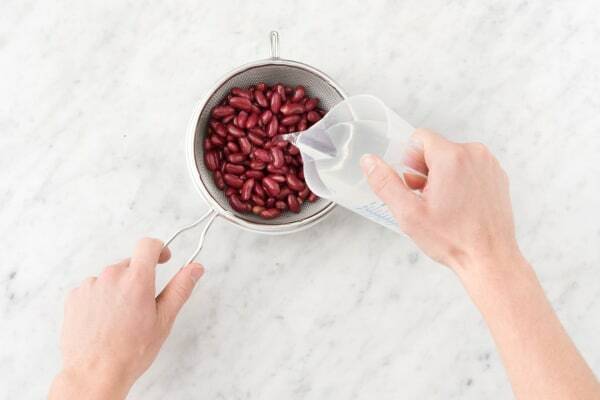 This little trick gives you the best tasting dish in minimal time! You are welcome! Pre-heat your oven to 200 degrees. Remove the dark green top and the bottom root from the leek. Cut in half lengthways, then slice into thin half moon shapes. Peel and grate the garlic (or use a garlic press if you have one). Remove the core from the red pepper and chop into small 1cm chunks. 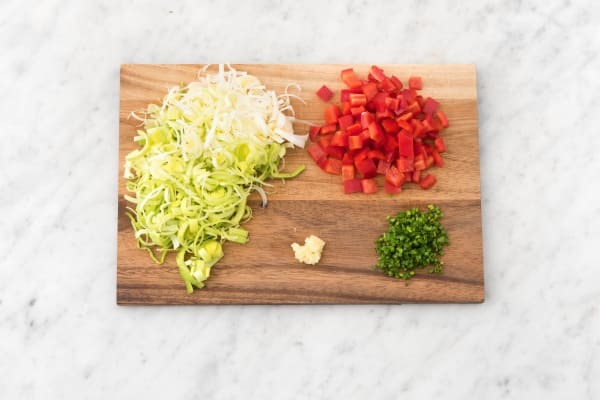 Chop the chives into ½cm pieces. Tip: Use scissors to do this if you want! Put a large frying pan on medium-high heat and drizzle in some oil. Add your leek and pepper and cook for 5 mins until softened. Tip: Don’t worry if they colour slightly, this will just add to the flavour! While your veggies are cooking, remove the sausage meat from its skin (discard the skin) and drain and rinse the kidney beans. 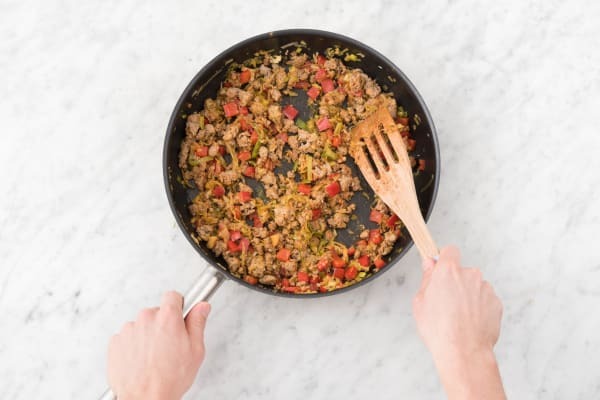 Once your leek and pepper are soft, add your sausage meat to the pan. Cook for 5 mins, use a spoon to break it up while it cooks. Once your sausage meat has cooked for 5 mins and is browned, add a good pinch of salt and a grind of black pepper. Add in your garlic, smoked paprika and ground cumin. Mix together and cook for 1 minute more. Pour the chopped tomatoes into the pan. Refill your tin(s) a quarter with water and add to the pan as well. Add the beef stock pot and stir until dissolved, then add your kidney beans. Stir together and cook for 10-12 mins, until your chilli is thick and tomatoey. While your chilli cooks, make your tortilla chips! 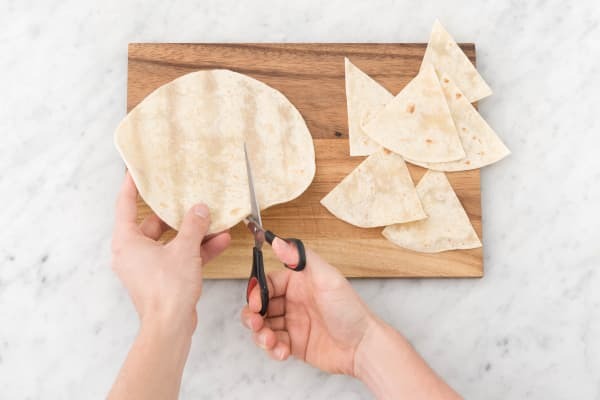 Using some scissors, cut each tortilla into eight triangles (we used one tortilla per person but if you want to use two per person, that’s fine - you have enough!). Place your chips on a large baking tray in a single layer and drizzle over some olive oil. Sprinkle over a pinch of salt and a grind of black pepper and pop in your oven for 4-5 mins. Tip: Keep an eye on them to make sure they don’t burn! Taste your chilli and add more salt and pepper if necessary. 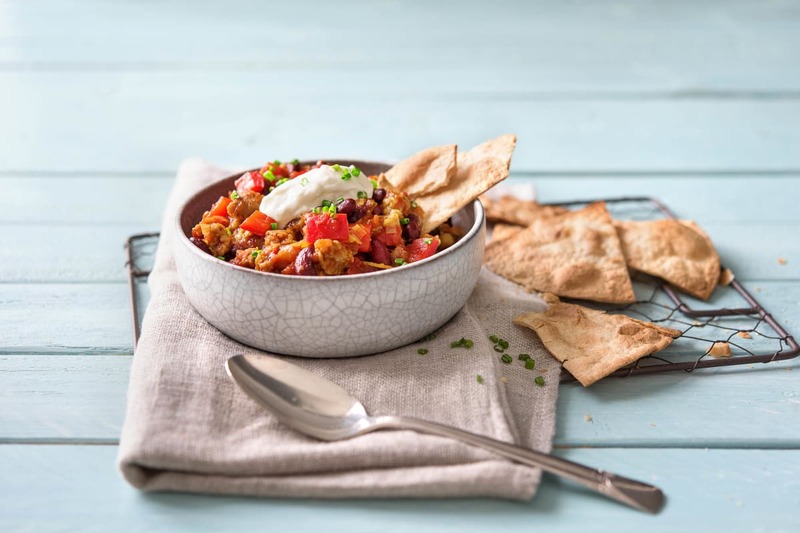 Serve your chilli in bowls with a spoonful of yoghurt on top and a sprinkling of chives. Place your tortilla chips on the side of the bowl (for scooping purposes) and enjoy!